AidCoin is an ERC20 token that aims to become the preferred method to donate transparently through blockchain technology and to access the net-work of our services. The online donation market is $15bn in the US alone. The rapid adoption of cryptocurrencies will definitely impact the way to do-nate in the future and AidCoin is set to play a leading role in this new era of fundraising. • AIDPay is an exchange payment gateway that allows charities to easily inte-grate and accept donation in crypto. AIDPay converts fiat and the most im-portant cryptocurrencies into AidCoin, providing a tax deduction receipt to donors. People can support a great cause and easily save money from their taxes. AIDPay’s fees are paid in token. • AIDChain is our own blockchain explorer that tracks AidCoin donation flows. It will be accessible to anyone - even to those with limited tech skills. 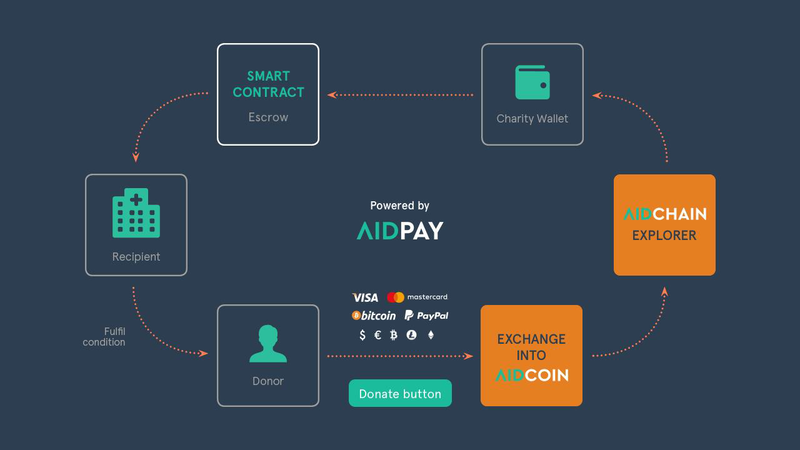 AID-Chain will be able also to track fiat money flows thanks to the integration with the banks’ API, providing a full transparent picture on how charities are using the funds. AIDChain’s fees are paid in token. • CharityStars is a company. Since its inception, our team of 25 professionals has worked with 500+ char-ities including Unicef, Save the Children and WWF. Our core competency is the ability to forge high-level partnerships between charities, celebrities and high-profile corporations. Unlike other projects looking to tokenize the non-profit sector, CharityStars has developed an ecosystem of charities, donors, celebrity donors and gala events to jumpstart the immediate use of the to-kens – indeed, such ecosystem is already up and running. CharityStars, therefore, has the capabilities and resources to fulfil the blockchain promise to the nonprofit world. • CharityStars shall utilize the token internally to incentivize adoption and re-tention rates by the 40,000 bidders within the CharityStars community, who will be required to purchase and keep AidCoin tokens in order to participate in the most exclusive auctions. ICO supporters can immediately use the Aid-Coin token on the CharityStars platform to participated in the five hundred monthly high-profile auctions featuring celebrities, artists and luxury brands. CharityStars’ fees will be paid in token. 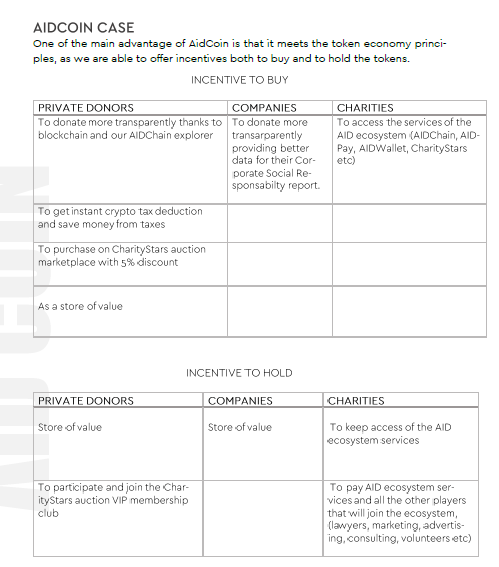 • As outlined below, in token economy section, AidCoin has laid down the basis for a real token economy where all participants, both donors and char-ities, are incentivized to buy and keep a portion of the tokens. To additionally sustain a healthy long-term value to the coin, we are introducing a burning fee mechanism to reduce the total supply of tokens. Since commissions are paid with tokens, a variable portion of the them will be burnt over time. As the volume of the AidCoin ecosystem increases, the total supply of tokens decreases pursuant to the burning fee effect. • The entire process of our token sale has been audited by accredited advi-sory firms to be fully compliant with current industry best practices and mar-ket regulations. The ICO placement and the KYC and AML process will be assisted by BitcoinSuisse, a Swiss-based financial provider specialized in crypto-asset who already successfully held more than 20 ICOs, raising more than $500 million. CharityStars will develop AIDChain, a personalized blockchain explorer platform with a simple and clear user interface, accessible both through website and mobile applications. The aim is to provide a tool accessible to anyone, especially to peo-ple that are not familiar with the blockchain or lack tech skills: our aim is to make the explorer accessible to all donors. • Transparent on chain transactions: thanks to the Ethereum blockchain, the combination of AidCoin and AIDChain will provide transparency in the non-profit sector, allowing individuals to track their donations along the chain. AidChain will show all the data related to a donation and linked to the block-chain by providing a receipt of each donation, which can then be held as conclusive proof. Each receipt contains: donation amount, timestamp, do-nor address and name (if public), recipient address and name. ghout the European Union. Pursuant to PSD2 law, European banks will be required to adopt publicly avaible APIs starting from January 2018 until the end of the year. AidCoin is collaborting with TrueLayer, a UK licensed com-pany that build financial apps that connect to bank data, verify ac-counts, and access transactions in real-time. Thanks to this collaboration AidChain will able to seamlessly communicate with the charity bank APIs and provide a clear picture on how the charity is spending the funds received. If a charity does not have this kind of service from its bank (not EU charity) we will provide a software to easily give access to our blockchain and man-ually input off chain data. For example, if the organization states in the ledger that the money is going to be used for medical supplies, the organi-zation will be prompted to upload the receipts for the supplies and shipping within the timeframe stipulated, and everything will be recorded on AID-Chain. 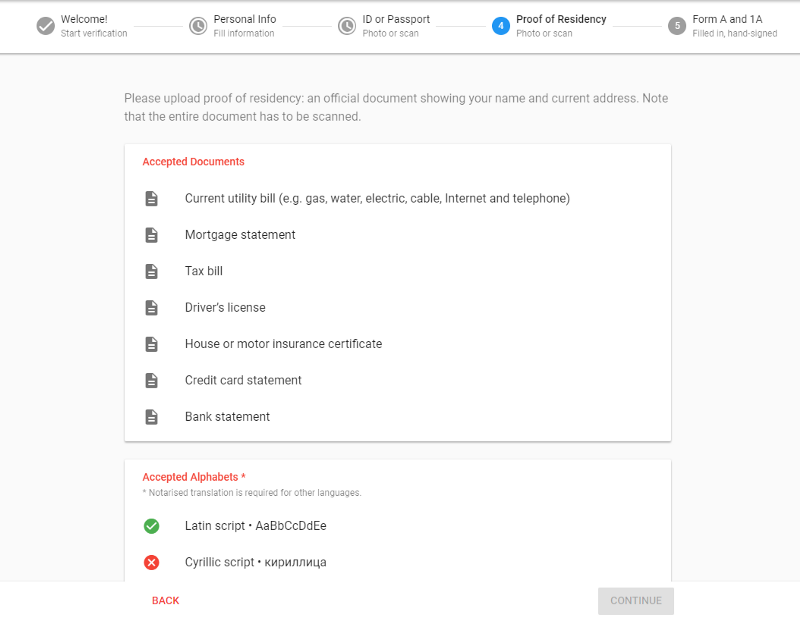 Through techniques like timestamping on blockchain or the upload-ing of almost any type of document on the Ethereum-based blockchain eco-system, it is now possible to certify the identity of the document owner, as well as its date and time. Moreover, with the technology offered by plat-forms such as Bloki (https://www.bloki-chain.com/), you can also verify the integrity and compliance of a file uploaded on Ethereum's blockchain at any time. Even through the use of APIs, such as those offered by Bloki, it is pos-sible to receive irrefutable proof to confirm the successful receipt of a do-nation initiated through our platform. • Account and identity management: charities, once registered and verified, will be able to create an organization account providing several information to donors (general info, official address, donations received). This kind of KYC identity process will be crucial for the Tax Deduction Recipt service that we aim to provide for those who are donating with AidCoin. AIDChain will be able to ensure that the address corresponds to an official registered char-ity. • Communications management: through Aichain platform, nonprofits will be able to send personalized report and automatic communications emails to donors without the cost of creating and maintaining their own platform. 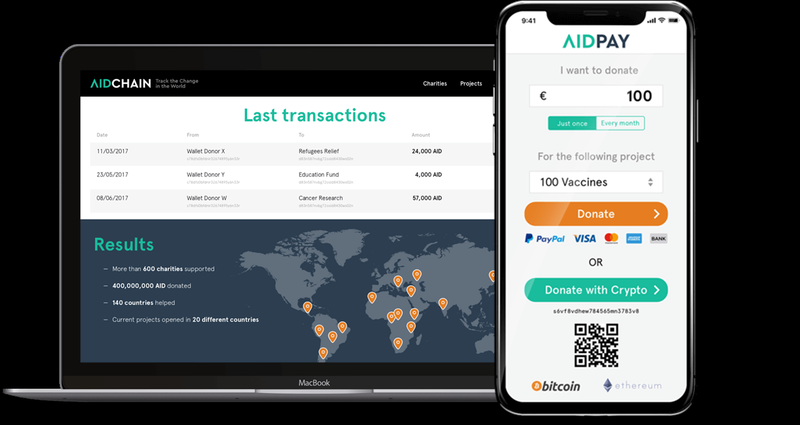 • Donations payment: a built-in wallet (AIDWallet) will enable every registered user to directly manage their AidCoin and donate them without leaving the platform. • Developing our own AIDWallet will require some time; in the meanwhile, we are partnering with Eidoo, a leading crypto wallet that simplifies the inter-action between the blockchain and their users, in order to offer to our char-ities an iOS and Android app to store, receive, convert and spend AidCoin tokens in an easy way since day one. AIDPay wants to become the payment gateway processor for all the donations made with crypto. Our technology allows to convert BTC, ETH and the most im-portant altcoins into AidCoin at the current exchange rate. 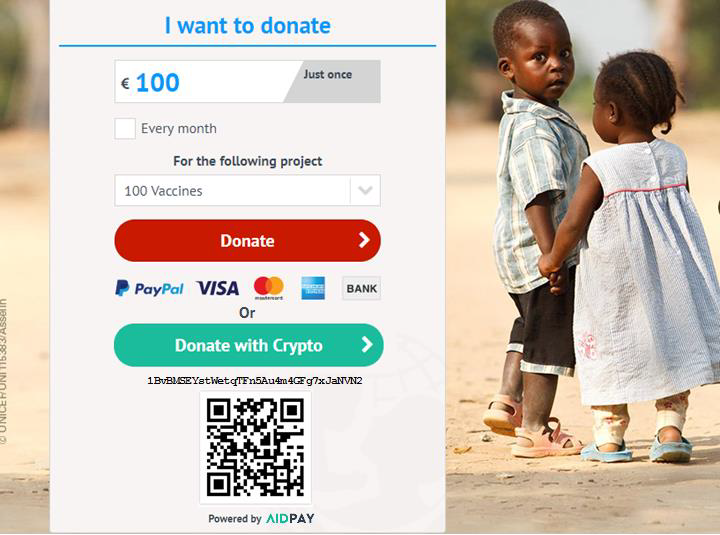 Incorporating the AIDPay button into their websites, charities can start accepting crypto currencies for their fundraising campaigns avoiding the hassle for the char-ities to utilize different wallets. The aim of smart contracts is to provide more security than traditional ones and reduce the transaction costs. Various types of clauses can be created as partially or fully self-executing, self-enforcing, or both. Implementing smart contracts in the nonprofit sector adds a layer of security for donors, allowing the transfer of funds only if specific conditions are met. For example, a fundraising campaign may be deemed successful only if at least 50% of the funds needed are raised: if the condition is not met, the smart contract will return the donations to the donor. Similarly, a smart contract can keep the donation in an escrow account until independent validators confirm that the charity has delivered the promised project. We believe that smart contracts are playing a central role in increasing the adop-tion of crypto donations. Nonprofit organizations and other fundraising platforms (eg. crowdfunding) will be more incentivized to accept AidCoin as the preferred method to donate if, in addition to the public transparency provided by AIDChain, the donors will be sure that their donations are used only upon fulfilment of set conditions and contingencies. AidCoin is enthusiast to collaborate with open source smart contract apps like Giveth.io and Alice.si. • Discount price: auctions paid in AidCoin will benefit from a 5% discount on the hammer final price. As the platform’s average ticket is $500, this results in a big incentive to donors to use the tokens as a medium of exchange. • Membership club auctions: to participate to these special auctions, users will need to have AidCoin deposited in their wallet. The amount of tokens required will change based on the auction’s nature and price. This will ena-ble certain users to bid on some of the most amazing once-in-a-lifetime ex-periences we have ever hosted on our platform. The token generation event will create and distribute a maximum of 100 million AidCoin. To reward our early adopters and community supporters we will held a token pre-sale with a 20% bonus, starting on November 20, 2017. The maximum amount raised on pre-sale will be 8,333 ETH for 10,000,000 AID. Unsold tokens will be allocated to crowdsale. Crowdsale allocation will start on December 15, 2017 and will be managed by our partner Bitcoin Suisse AG, a Swiss-based financial provider specialized in crypto-asset who already successfully held more than 20 ICOs, raising more than $500 million. The amount raised on crowdsale will be 30,000 ETH for 30,000,000 AID plus ETH raised for tokens possibly unsold during pre-sale. 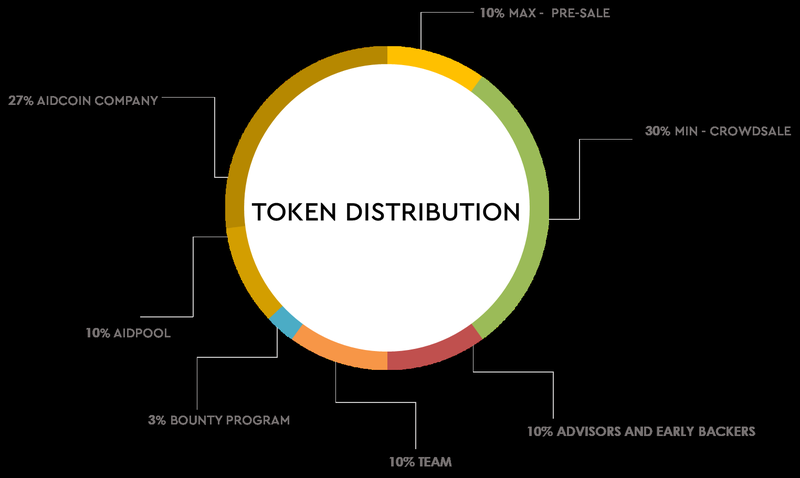 • 3% of tokens (3,000,000 AID) will be used to eventually create a bounty program. Unused token will be reallocated to the AidPool. No further issue of AidCoin tokens will be made. • to derive any economic or other gain from the Company. The Client there-fore acknowledges that they are fully aware both that the tokens are in no way associated with ownership rights, voting rights or dividend rights, and that they do not constitute shares in CharityStars or in any other comparable asset. • To cooperate with social responsible companies in order to transform Aid-Coin the preferred method of giving transparently. 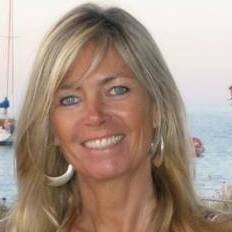 • To invest in PR and marketing campaigns to dramatically increase the to-ken’s awareness and diffusion. Within the platform, we will provide identity for KYC that can help individuals track all of their donations across different platforms. Today, you may give to your favor-ite charity in a variety of ways. You might round up your Amazon purchases with AmazonSmile, give a percentage of your eBay sales, contribute to a friend’s charity run and also bid at a charity auction. You’ve given to this same favorite charity in 4 ways, but today you have no way of tracking that. If you were using AidCoin tokens, you would be able to see on your dashboard exactly what you’d given, how you’d given it and where it went. You get the satisfaction of seeing your numbers grow as you give to this charity, and you’re able to read reports from recipients of your charity. At this point, the ecosystem will grow naturally, with fundraisers, donors, charities, and corporate giving organizations naturally choosing to use AidCoin. 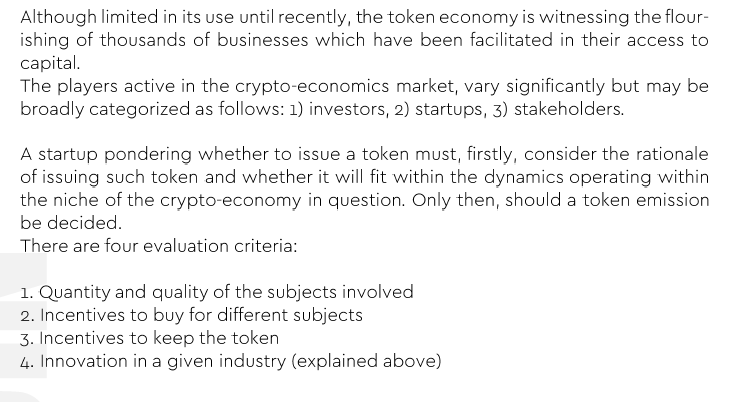 Philanthro-pists might choose to purchase AidCoin tokens for their foundations to ensure that the funds can be used only for their intended purpose. Charities might choose to pay portion of their employees salaries in tokens or they might use to reward their volunteers. Social responsible companies such lawyers firms, event organizers, pr firm, real estate agency etc might start to accept tokens for a portion of the pay-ments. Over time, this form of giving will be preferred worldwide for the ad-vantages of transparency, smart contracts, reduced transaction fees, and user-friendly updates and connectivity between donors and recipients. Delivering AIDPay, starting to convert from fiat and the most popular crypto currencies. Creating embed widgets for charities to integrate the donation button into their donation pages. First beta of AIDWallet released. Completing the first beta of our AIDChain explorer and the integra-tion with bank APIs. Releasing the AIDWallet second beta, allowing the cashout feature crypto to fiat. Majority of transactions on CharityStars are conducted through Aid-Coin. Partnership with other players will be achieved. Completing the final AIDChain product with several new features such as donor KYC, email traking system etc. Developing a new set of APIs for additional services of the AID net-work. With the AidCoin ICO fast approaching, we are getting more and more queries on how to register, so here is a quick guide to help you through the process. 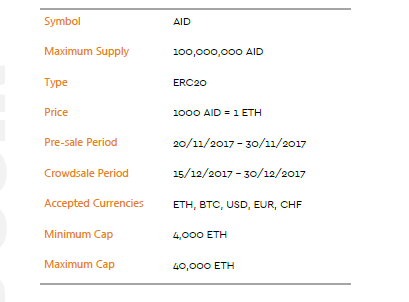 AidCoin ICO starts January 16th at 12 pm CET. Here is how you can register to the ICO for the token that allows you to donate transparently. If you are logging on for the first time, choose the tab labelled Sign up. 2. Type in your email and create a password. 4. Go to your email host and verify the email with the link that has been sent to you. Now you need to get approved for participation in ICO’s by submitting the required documents. - The ID needs to be in Latin letters otherwise it needs to be translated and notarized. 2. on The Selfie ID your whole face needs to be visible and the whole ID/passport needs to be visible and readable. 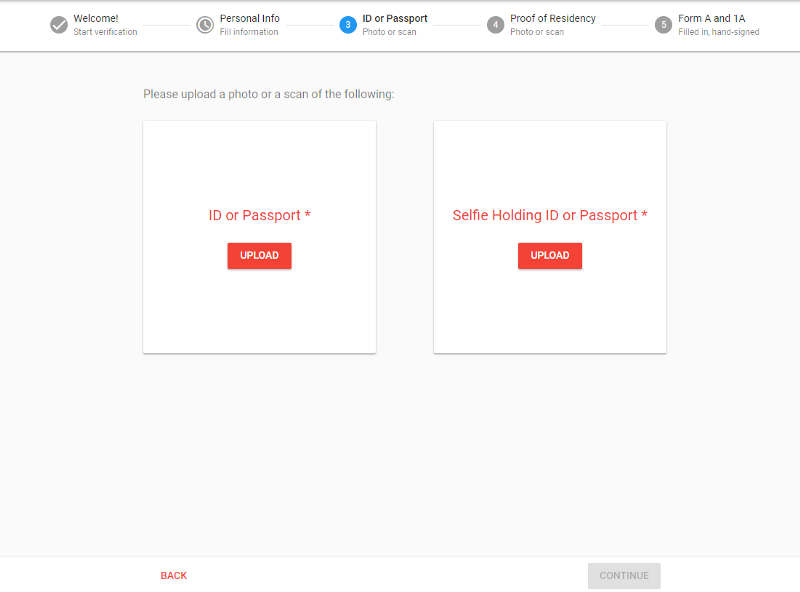 The ID on your Selfie ID, has to be the same as the approved ID. Here you need to upload a proof of residency. This needs to be in Latin Letters or translated and notarized. It needs to be with the address where you live, not work address or place of birth. The last documents you need to upload are the Form A & 1A. All registrations need to have both forms filled out, signed and approved. All mandatory fields need to be filled out and all the information needs to be correct. 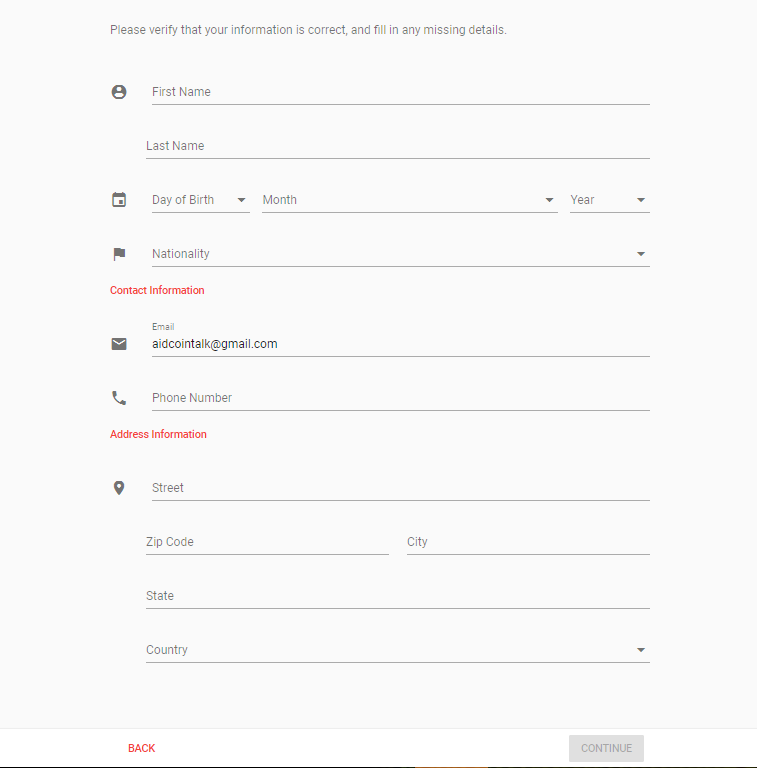 Form A includes your personal data previously filled out, so you can simply print it out, sign by hand and upload it. Both form A and form 1A need to be signed by hand — otherwise they can not be approved. 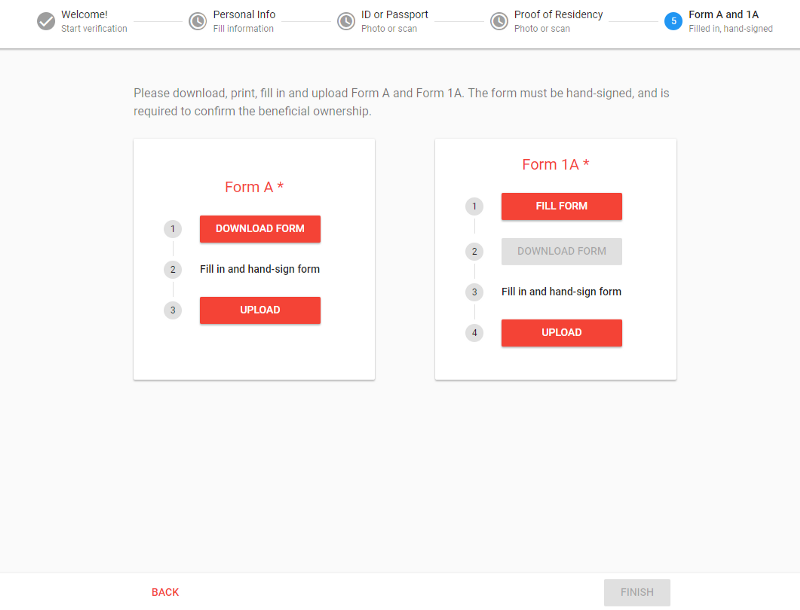 You can now download the form 1A, print it, sign by hand and upload it to the platform. Once everything is submitted you will see a small grey box with your mail stating that your request is awaiting approval. If you have followed all the steps correctly, then your submission should be approved within a few days and an email of approval will be sent to your mail account. 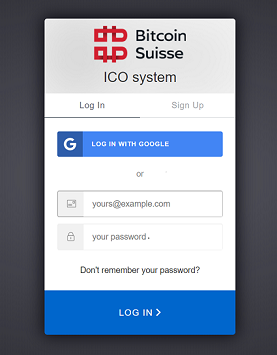 When your account has been approved, you will be able to sign up to partake in ICO’s through Bitcoin Suisse. We hope this quick guide was helpful, but please feel free to contact us for any further queries. Join the growing AidCoin community to discuss the project. Get involved and spread the word with your contacts and favorite charities! Following the previous announcement, we are happy to confirm that the AID tokens will be unlocked within the next 24 hours. We are also excited to announce that we have finalised the agreement with a top 5 exchange and we will communicate further details in the following days! As previously stated, part of the tokens minted during the ICO will be distributed to token sale participants through an airdrop to reward all of you who will hold their AID tokens for a specific period of time after the ICO. An airdrop is when a blockchain project decides to distribute free tokens, or coins, to specific token holders. All participants in the AidCoin pre-sale and/or ICO will receive an airdrop based on the number of tokens bought during the token sale and not moved for a period of time, specifically 3, 6, 9 months from the 16th January 2018. After 3 months: you will receive 5% of the tokens bought on token sale and not moved for 3 months. After 6 months: you will receive 7,5% of the tokens bought on token sale and not moved for 6 months. After 9 months: you will receive 12,5% of the tokens bought on token sale and not moved for 9 months. Therefore you will receive an additional 25% of the tokens bought on token sale if you hold AID tokens for 9 months! You’ll receive 50 AID, if you do not move your AID tokens for 3 months. You’ll receive 125 AID, if you do not move your AID tokens for 6 months. You’ll receive 250 AID, if you do not move your AID tokens for 9 months. IMPORTANT: ONLY the tokens bought during the pre-sale and the ICO will be counted for the airdrop. If you move the tokens you will lose the right to receive the airdrop on the amount moved. For example, if you bought 1,000 AID and move 300 AID before the vesting period, you will receive the airdrop just on the amount unmoved (700 AID). The AID received on airdrop (for example after 3 months) will not be taken in consideration for the token count. If you bought 1,000 AID, after 3 months you will receive 50 AID. If you hold for other 3 months, you will receive 75 AID (7.5% of the 1,000 AID bought initially, not of the 1,050 AID cumulated). Subscribe to the newsletter on our website https://www.aidcoin.co to be the first to hear the good news. Once again, thanks for your support and stay tuned! As you all probably know, last week we launched the highly-anticipated Beta of AIDChain and the first two charities to signup were Alice for Children and Laureus Foundation. We have already written a post about Alice for Children and now it’s turn to tell you more about Laureus Foundation and why it’s an achievement to have them with us. This has become the philosophy of Laureus and the driving belief behind all the Foundation does. 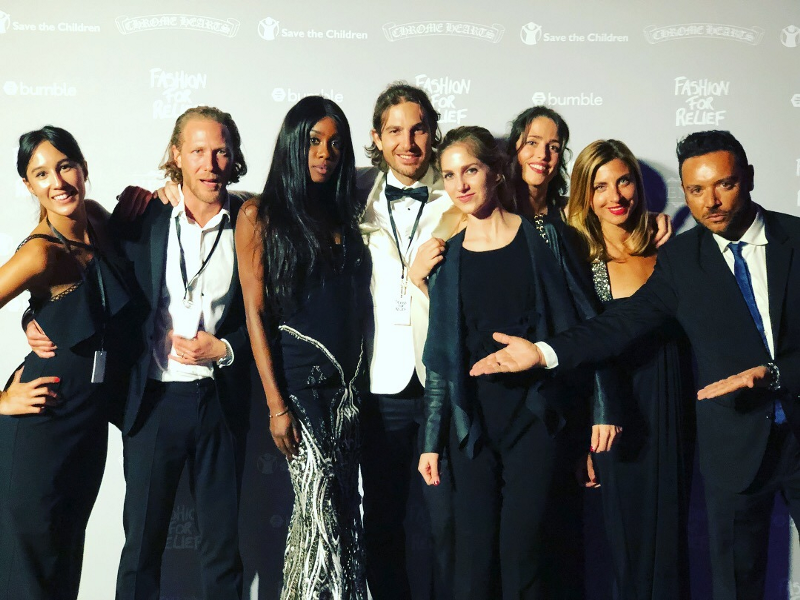 Our founding company, CharityStars, has already been collaborating with Laureus for several years and supported it with live bidding technology at two Laureus Gala dinners. 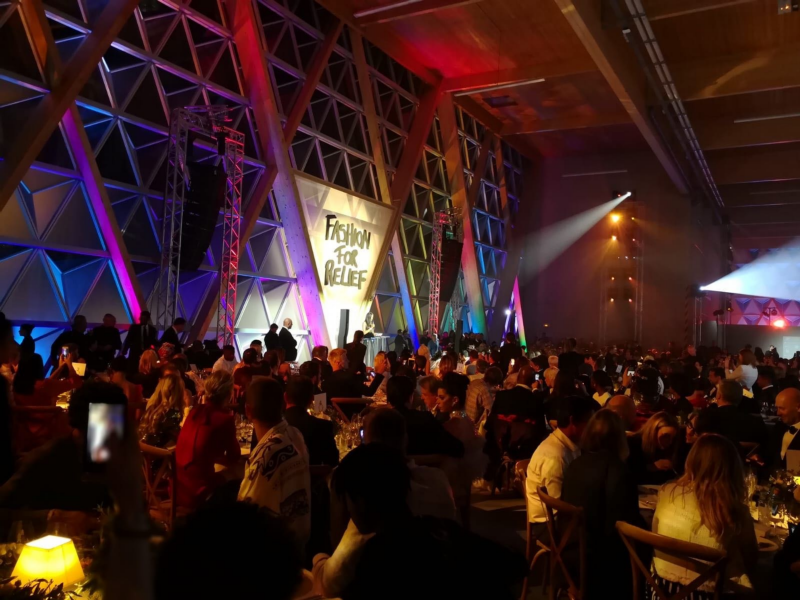 These Gala dinners, Laureus F1 Charity Nights, are held annually and attended by top sports and show business celebrities, such as Lewis Hamilton, who participated last year. Below is also a video from the Laureus World Sports Awards that is held annually to celebrate the most remarkable men and women from the world of sport along with their achievements from the previous calendar year. All stated above, especially the scale of Laureus’ work and our previous successful cooperations, makes for a great partnership and we can’t think of a better early adopter for AIDChain. Meanwhile we keep working closely on integrating new charities so keep an eye on our publications and don’t forget to try our Beta if you haven’t done so yet! Now that we’ve launched the Beta we can’t wait to start raising donations through it. And the first step in this regard, as mentioned in the Beta release post, is launching particular fundraising campaigns as that’s where the current tracking features of AIDChain can be best applied. In one of such campaigns several ICOs will donate crypto to one of the major international charity funds’ project. And even though we cannot publicly disclose more details yet, we can already announce that one of the ICOs willing to donate around $25,000 to this campaign is CanYa, a global P2P marketplace of services powered by Blockchain with over 13,000 followers. Why this partnership will be a win-win for everyone? If we address the large scale benefits for the charity sector — having CanYa as a participant, we will be able to raise more funds for this project and be sure these funds will be spent correctly thanks to the AIDChain transparency features. If we look at the benefits for the crypto sphere —often crypto is perceived as something only speculators and drug-dealers are involved in, but we have a chance to change these connotations. Crypto philanthropic initiatives don’t go unnoticed by both conventional and crypto-oriented media and the more ICOs participate in this campaign, the bigger PR blast we’ll be able to create thus contributing to a better image of crypto as a whole. Finally, talking about ICO participants’ benefits— this partnership will enable us to attract attention to our projects, get new leads and consequently, new users and token holders. Overall, this will be a great opportunity to grow and gain more traction with the community for all of us. Even though CanYa is more than willing to participate in this project, it has decided to let its community choose between 4 alternatives to donate the funds to. Therefore, in order to win in this competition, we kindly ask you to show some support and vote for us until April 30th! And since we have always appreciated the help of our community, this time we would like to give back some love to those giving us a hand. In order to win you simply need to spend 1 minute and follow this link to vote for AidCoin. 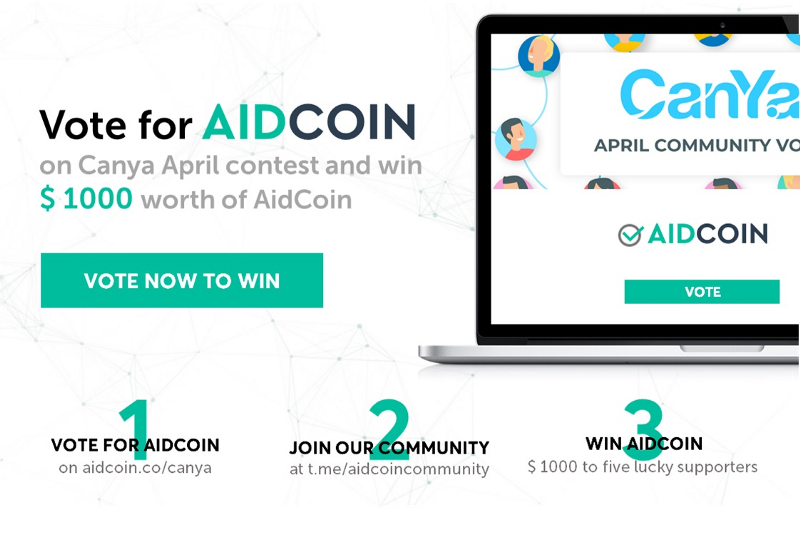 After April 30th, we will randomly pick 5 of you, AidCoin voters, and give each $1,000 worth of AID. Important: In order to be elected please make sure to fill the fields “Name” and “Telegram Handle (see below for Discord)” in CanYa’s voting form. 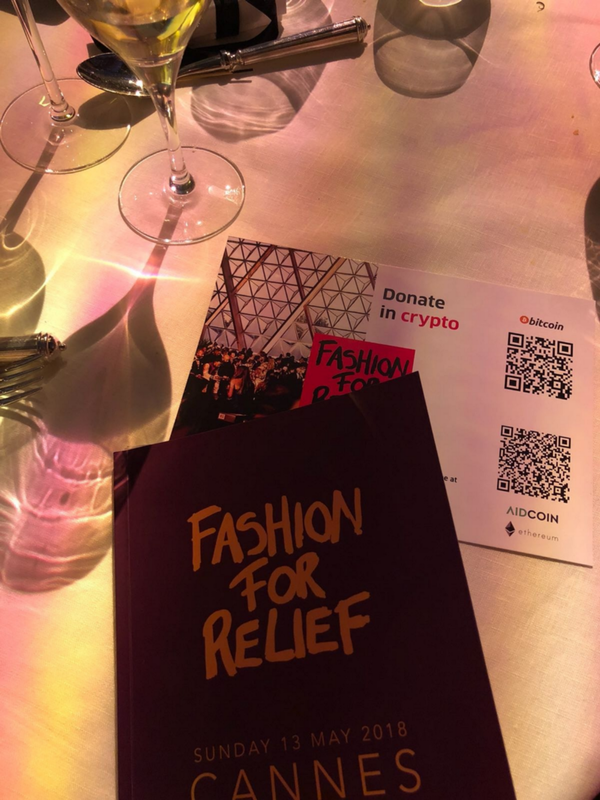 The number of AidCoin adopters keeps growing fast and we are proud to announce the new arrival: Fashion For Relief — a charitable organization dedicated to improving the lives of those living in adversity through uniting the fashion industry as a force for good. Founded in 2005 by the all-time famous supermodel, Naomi Campbell, it has since raised over 15 millions for charities supporting the fight against Ebola, disaster relief after the Japanese earthquake and tsunami, the Haiti earthquake, Hurricane Katrina, child refugee crises, and other noble causes. 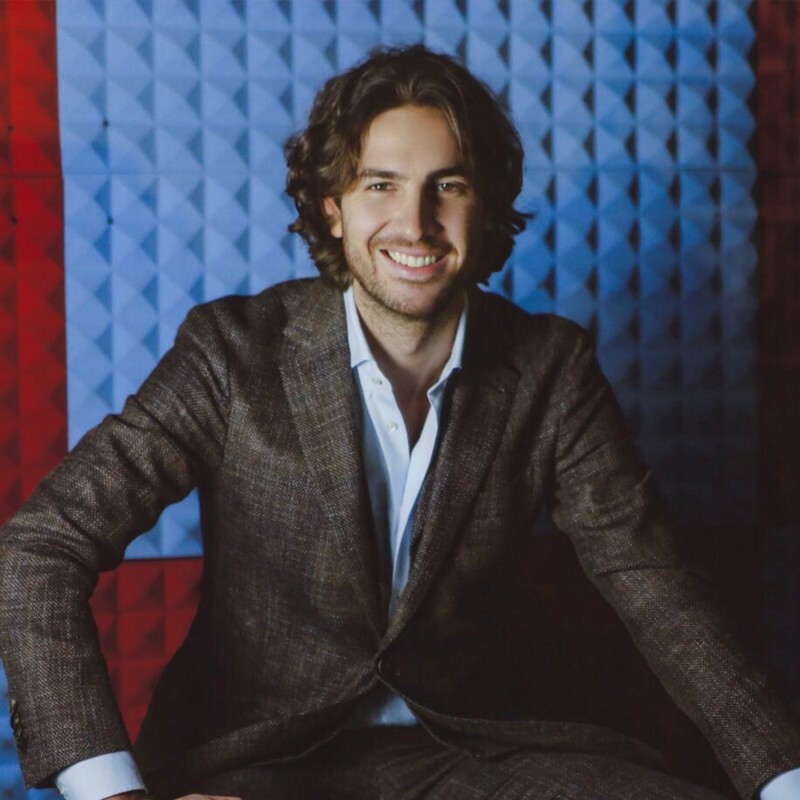 Fashion For Relief has become a leading fashion industry charitable brand and has teamed up with a variety of likeminded actors, including our founding company, CharityStars. And last week, Fashion For Relief, which started as a fashion show benefiting causes in crisis, returned revamped in Cannes. 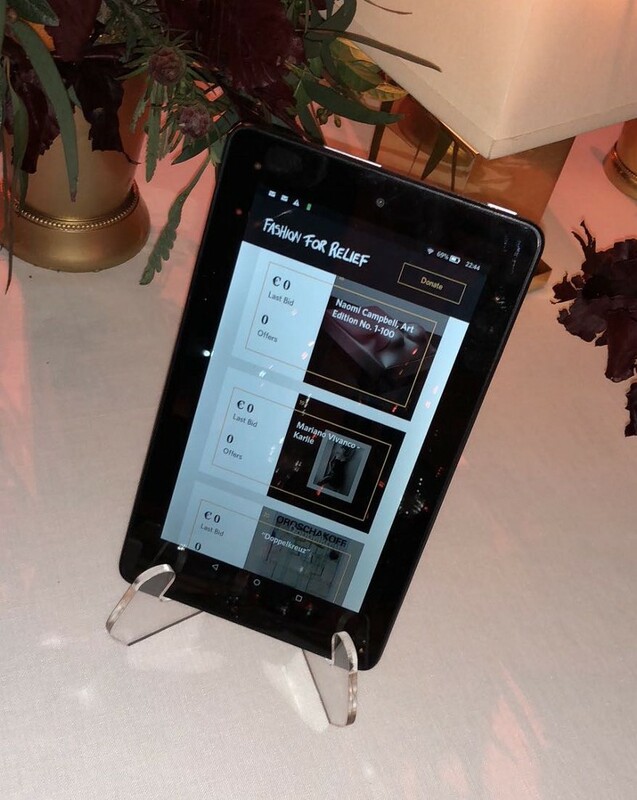 This year’s event included not only a runway show featuring fashion’s most iconic faces, but also a music performance and a dinner party followed by a live charity auction powered by CharityStars and AidCoin. Even though this is not the first year of our cooperation, it is certainly the first time that Fashion For Relief accepts bids in crypto. This became possible thanks to the synergy of the CharityStars’ live bidding system and the AidCoin technology, which together facilitate the bidding process, allowing people to submit their bids in fiat, BTC, ETH or AID not stepping away from their dinner tables. After the auction, all proceeds get converted to AidCoin and directed to the main beneficiaries of the event: Save the Children and Time’s Up. 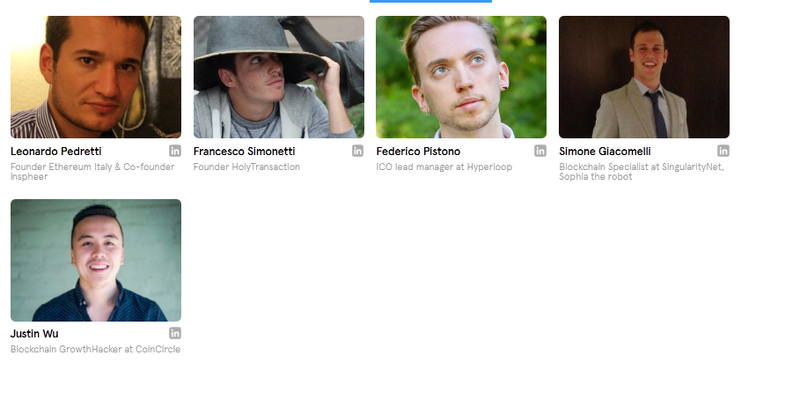 Moreover, even though the event is over, our collaboration goes on: 40+ auctions in support of Fashion For Relief will be live for 15 more days on the CharityStars platform, with BTC and AID accepted for bidding. While crypto market might be not in its best days, the number of cryptocurrency holders is barely shrinking. That’s why we will keep leveraging CharityStars’ network of over 400 brands, celebrities, and event organizers to bring crypto to the most famous Gala-events worldwide. We know this is by no means a short journey because at the moment there are still not many cryptocurrency holders. However, taking early step in this direction will ensure that AidCoin becomes an established way to donate in future, and that’s what we’re aiming for. 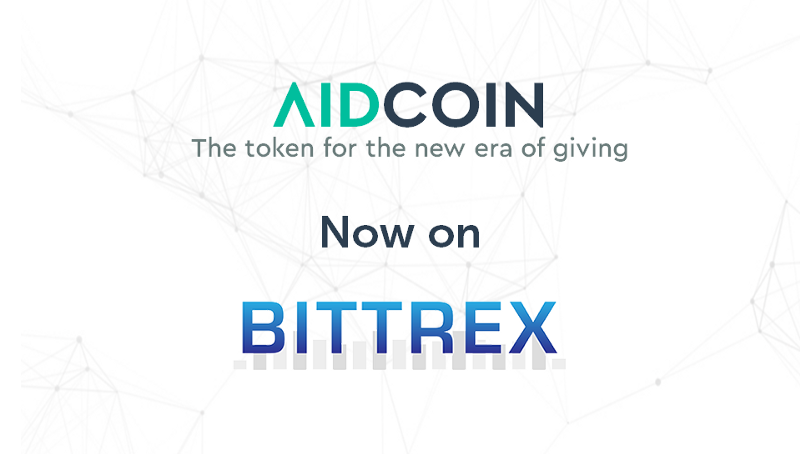 We can’t wait to share the incredible news you’ve all been waiting for: AidCoin is now listed on Bittrex! Following all your questions regarding the listing timelines, which we were unable to reveal due to the non-disclosure agreement we had signed, we can finally share some details. Bittrex operates the premier U.S.-based blockchain trading platform, which is designed for customers who demand lightning-fast trade execution, dependable digital wallets, and industry-leading security practices. You can already trade BTC/AID here or ETH/AID here. Furthermore, we want to reassure you, that Bittrex was, and still remains, not the only exchange we are liaising with. We always respect our Roadmap and do our best to comply with any statements we make. That’s why we keep working hard to get listed on other top exchanges to increase AID liquidity and facilitate the process of using AID by our donors, charities, and other actors. As you might guess, those exchanges receive dozens of applications everyday so getting listed there indeed takes time and devotion. 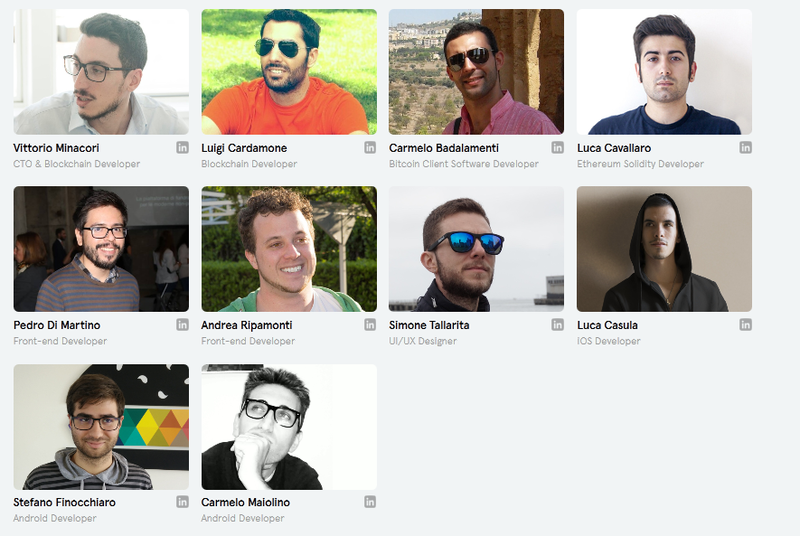 However, since we are set to provide our users with the best experience possible, we’ll keep pushing! Thank you for your patience and support once again and stay tuned! 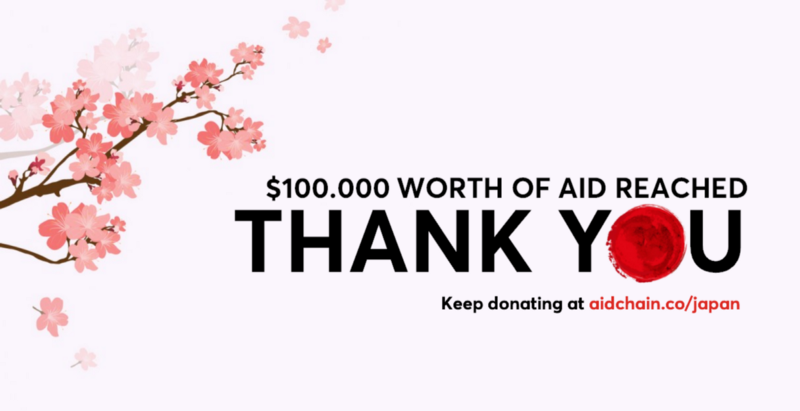 On behalf of AidCoin and Japan we thank you all for this overwhelming support! Thanks to your retweets, we’ve reached the budget cap set for this campaign, however, donating $5 for a retweet is not the only incentive we have in store to maximize the number of donations. We decided to encourage our donors’ virtue by providing one randomly picked donor with a special prize — an opportunity to attend BlockShow Americas 2018 in Las Vegas, August 20–21st, together with the AidCoin team. The air tickets to Las Vegas and back, single conference pass and accommodation for the days of the conference will be covered. Track the announcements in our Official Telegram Group to find out who’s the winner! We will soon publish the donor’s email that he/she provided when making the donation at AIDChain. So now that you have even more reasons to donate to Japan — go for it! 💪 Our community has already shown how motivated it is to support the cause by retweeting the post, now it’s time to donate and show how crypto donations can help the world! Big fish: WWF joins AIDCHain! One of the most famous charities in the world has registered on AIDChain, thus joining the era of transparent giving. Welcome WWF! The AidCoin team has been working hard lately to get several leading charities onto AIDChain to forge the way for other smaller charities and the sector as a whole. And the World Wildlife Fund Italia has become the first to embark on this important journey towards full transparency — now we’re looking forward to seeing more charities follow suit! This may be just the first step in our collaboration with WWF Italia but it’s clearly a significant development for AidCoin as well as the charity and crypto sectors. So, what does this mean for the charity sector? WWF Italia’s most recent move will undoubtedly affect the way people perceive big charities with all their structural complexity and unclear management of funds. This will be a showcase of how a modern charity can make use of cutting-edge tech solutions such as the one offered by AidCoin to increase the efficiency of fundraising and fund management. But most importantly, it will provide donors with a new and active role: instead of being outside observers, they will be able to track and even manage how their money is being spent. This, in turn, will help us to fulfil our mission to bring about a breakthrough in the trust crisis that has hit the non-profit sector, leading to a decrease in donations. 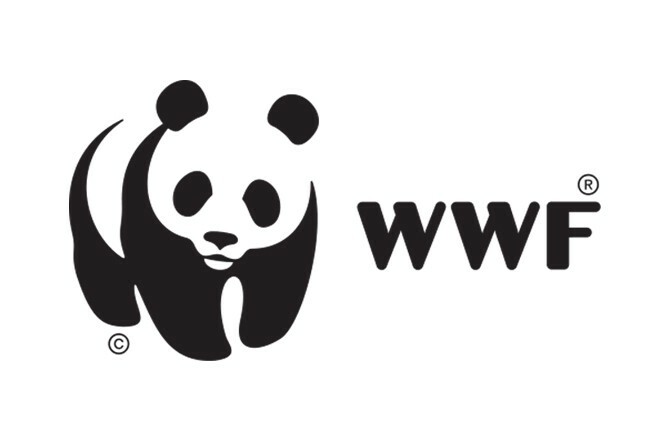 As for what this means for the crypto sector— it serves as a real-life application of cryptocurrencies as a method of payment: WWF Italia is committed to spending the crypto funds raised in crypto as is by transacting with its service providers through AIDChain (more details will follow in our next release specifically dedicated to WWF Italia’s campaign). This may not sound like anything special but it’s an unprecedented case that’s worthy of attention and here’s why: usually, even if a charity does accept crypto, donations get converted to fiat straight away, taking away the ability to track the allocation of funds further, one of the key benefits that cryptocurrencies bring. In the case of WWF Italia, however, crypto will remain crypto, allowing users to reap all the benefits this technology offers. And finally, by joining AIDChain, WWF Italia demonstrates just how relevant the blockchain technology is to the charity sector. It’s hard to imagine another sector where trust between parties is so important (and so easily breached by lack of accountability). In short, this collaboration between AidCoin and WWF Italia proves that AidCoin offers a solution to an acute problem in the charity sector — with the blockchain, cryptocurrencies, and smart contracts offering truly immense benefits. And even more importantly, top charities, such as the WWF, know it. P.S. Stay tuned to hear more about the WWF Italia fundraising campaign that will be launched soon!